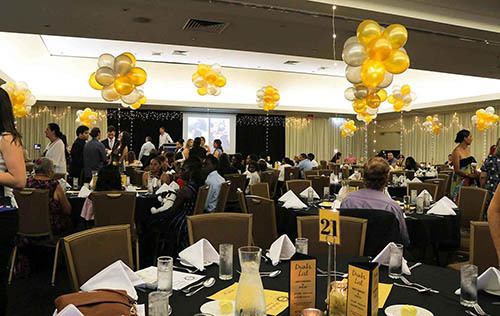 The end of the school year is fast approaching and our final newsletter for the year highlights what was a spectacular Graduation evening, held on 25th November at SkyCity Casino. It was tremendous to see the families and communities of those graduating coming together to share in the celebration with the students and staff. The students all looked fabulous and clearly enjoyed the celebrations with their families, friends and teachers. We wish the students all the best with their final results and the next phase of their lives post school. You will soon receive a copy of your child's report for Semester 2, and a copy of the 2016 School Yearbook - OUTPOST. It is a wonderful record of the year and contains lots of information about the activities of our students throughout the year. I am sure you will enjoy reading it as much as I did. I would like to offer my sincere thanks to all School Council members for their willingness to be a part of School Council this year. Particular thanks to retiring Council members: Barbara Dilettoso, Christine Watson, Vicki Proud, Maverick Torr, Caramon Khaisir, George Tumino and Cathy McGinness. Special thanks also to Tiani Cook for her role as Council Chair. The next meeting will be our AGM in March 2017. We will be actively seeking new parent, staff and student members for Council in 2017. If you are interested in being involved, please contact our school Reception. 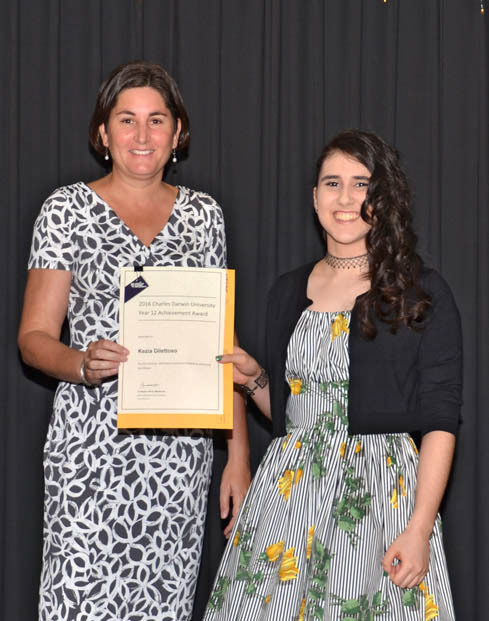 I would like to congratulate all of our students who have worked so hard to achieve their goals this year, and offer a sincere thank you to all of our teachers and parents, who have also worked extremely hard to support the students as they move through their senior years of schooling. To all our students who are leaving us this year, we wish you and your families all the best in the future. We look forward to you staying in touch and letting us know where your next phase of your life takes you, be it to university, undertaking a trade or into the workforce. In closing, I would like to wish everyone who is part of our NTSDE community here, a very safe and happy festive season, and I look forward to working with those of you returning to NTSDE again in 2017. The 2016 NTSDE Graduation Dinner was held in the Grand Ballroom at SkyCity Casino on Friday 25 November. The evening was warm but clear of storms. This allowed many guests to have their photos taken on the casino lawns, before entering the ballroom. The colour theme for the evening was black and gold and as you can see from the photos, the ballroom looked amazing. 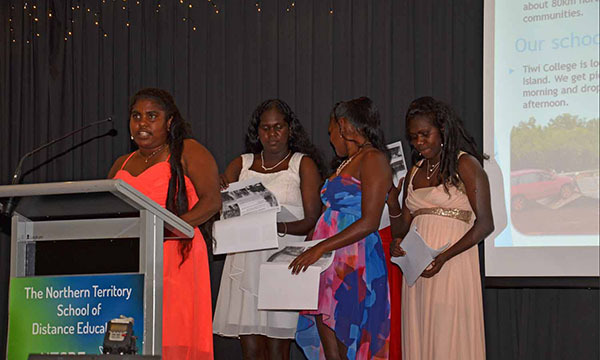 For Tiwi College, it was an extra special occasion as they are a relatively new school and this was the first time that they have had students complete their NT Certificate of Education. Ms Jenny Eddy (CDU Aspire Coordinator). Also in the audience were many Principals and staff of the NTSDE community and area partner schools along with the NTSDE Principal, Marcia Harvey and NTSDE staff. The night very much belonged to the students. The students looked glamorous, relaxed and no doubt very happy that the study year was over. 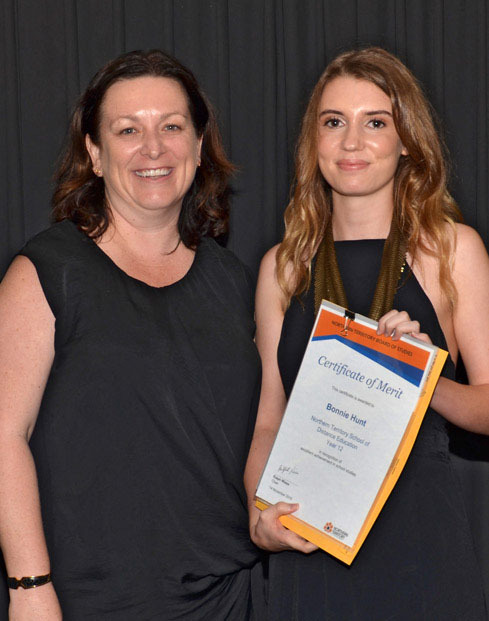 Bonnie Hunt - Top Academic Achiever Award. Well done to all those students and to the individual students who claimed the NTSDE 2016 Stage 2 Academic Awards. 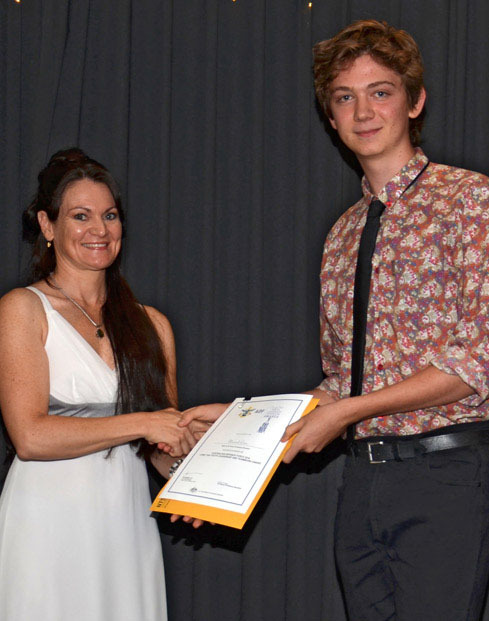 Bradon Proud, a 2012 graduate amazed the audience with his address in which he extolled the virtues of mathematics study, much to the delight of his 2012 Maths teacher, who was also in the audience! The student addresses and presentations were outstanding and as a guest commented 'I just had no idea how far and wide NTSDE delivers'. 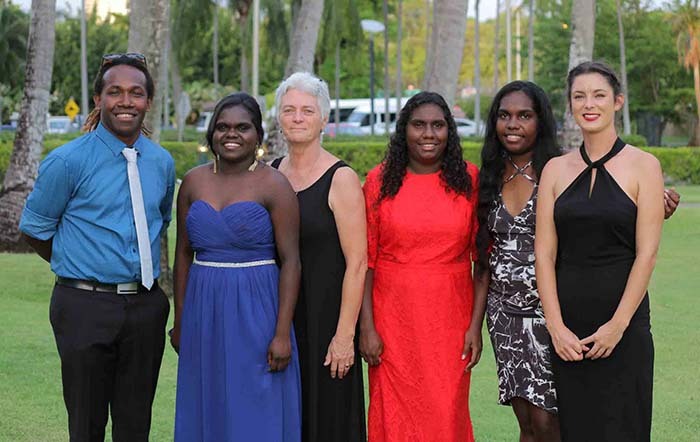 Tiwi College along with Xavier Catholic College presented their student addresses with an accompanying PowerPoint presentation that highlighted their educational journey and future aspirations. These presentations were a highlight with the students showing maturity and excellent presentation skills. 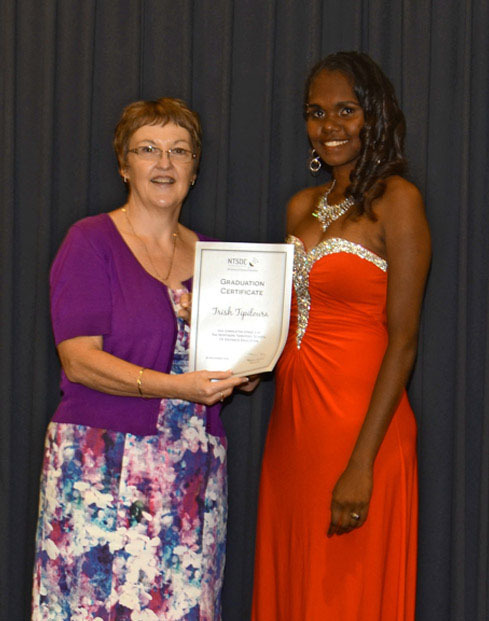 Isabella and Libby gave the NTSDE student address and Kezia presented Marcia with a gift. 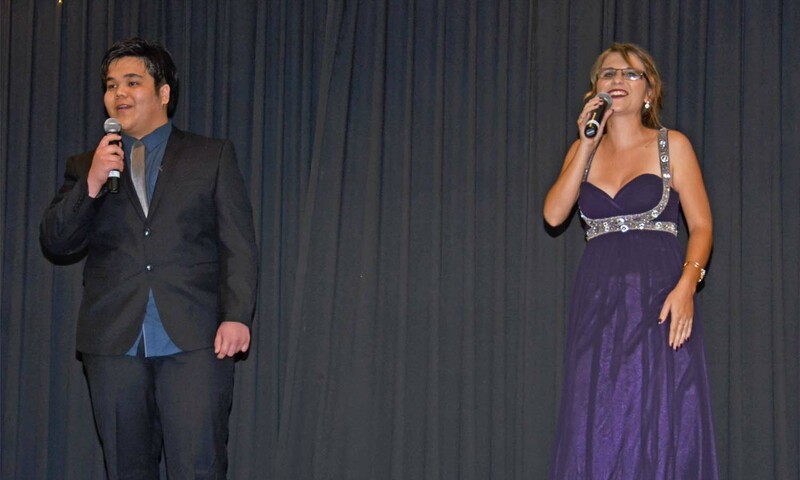 The absolute highlight of this special night of highlights was, NTSDE students, Libby and Ken singing 'Try Everything'. This had the audience clapping, dancing and really enjoying the musical item, presented by these talented young people. It was a wonderful evening. Congratulations again to all the students and thank you to all the guests who contributed with their enthusiastic and heart felt responses to the evening. All students who attended the Graduation will receive a disc of photos. If you don't receive a disc by the end of December 2016, please email deanna.ther@ntschools.net to arrange this. 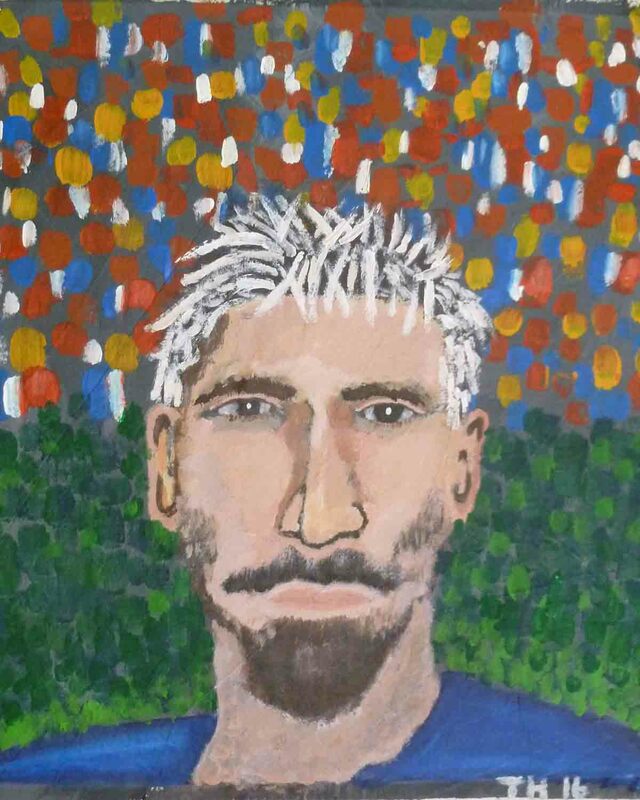 This semester for Stage 1 Creative Arts (1CVA10P), Woolaning students focused on painting and portraits with the on the ground help of Brad Bray, who is now very experienced delivering Art with NTSDE! They explored different painting techniques, including texture, broken colour, sgraffito and tonal blending. 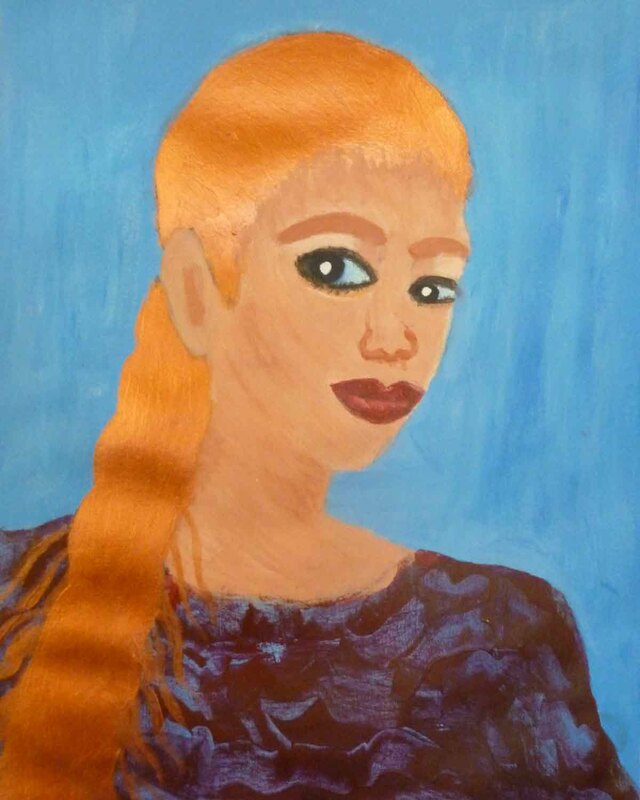 I worked with the students for a day to complete their final portraits. The students were well prepared, their research, experimentation and composition ideas all done so they were ready to paint. 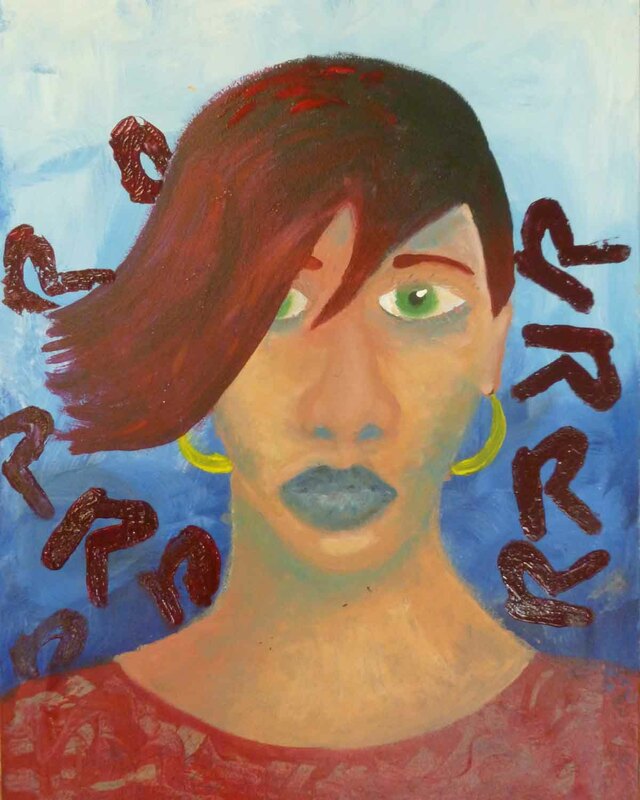 All the students showed maturity in their attitude to coping with problems and changes along the way, and all were really impressed with their final portraits. It was a great day working with them all. 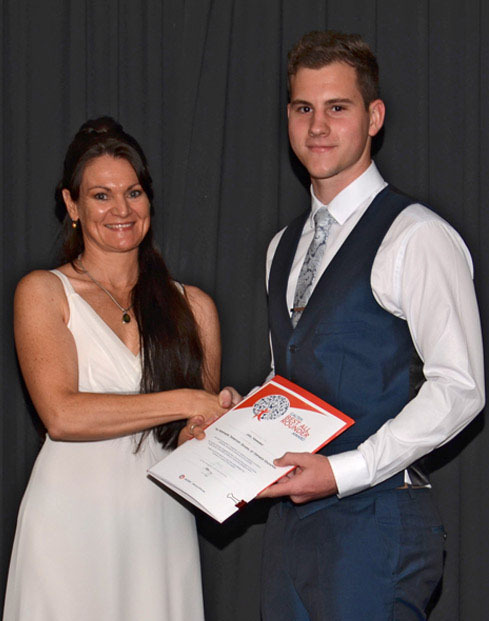 Congratulations to Adam Rettig for achieving excellent results and being the Top Achiever in Stage 2 Maths Applications and Stage 2 English Pathways. Adam received his awards at Alice Outcomes. 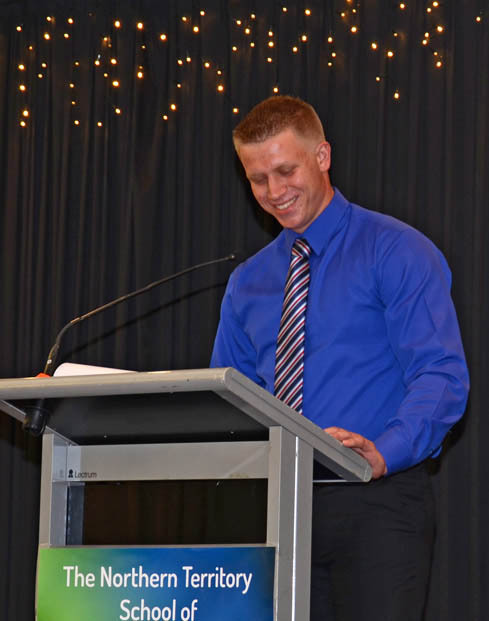 Adam is a mature age student who has juggled parenting with part time work and study. His goal is to become a pilot with the Australian Air Force, and already has years of experience as a pilot and helicopter pilot. He has achieved excellent results, showed determination and dedication to his studies. Also, congratulations to all Year 10 English students for their consistent and creative work throughout Term 4. Special mention to Portia Gallagher and Sandra Jestin for their excellent achievement in Year 10 English.